As we grow up and go through life we spend time looking for missing pieces that will complete ourselves, to make us whole. Those pieces could be a significant other or maybe just a really great sandwich, you never know. It was this search of missing things that came to mind as I watched the film Puzzle, because how could you not think of such a thing in a film about putting together jigsaw puzzles and relating that to finding your true self? 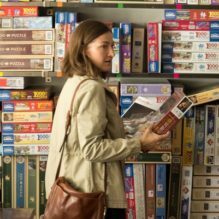 Puzzle is not as easily summed up as a movie about jigsaw puzzles, but they do play a part. Agnes (Kelly Macdonald ) is a wife that takes care of her family while her husband Louie (David Denman) is at work. Every night she has dinner waiting for him and her two sons while doing very little for herself. That changes when Agnes receives a jigsaw puzzle for her birthday and always being a fan of putting things together she takes a liking to it rather quickly. In the puzzle she discovers something she is good at and quickly seeks out more. Wanting to feed her new hobby she travels to pick out some more puzzles and while there comes across someone looking for a partner for a puzzle competition. This is how she meets Robert (Irrfan Khan), an inventor who made a ton of money on his only invention. At first their time is awkward as Agnes is slow to come out of her shell, but after a while together, feelings start to grow as Agnes discovers missing pieces to her life that she hopes will lead her to feeling complete. You might think a story about someone finding something missing in her life in a movie that has puzzles as the back drop would be a little cliché, but it really comes together, pun intended. The screenplay written by Polly Mann and Oren Moverman from the Argentinian film Rompecabezas can feel slow at times, but the story has heart and for someone who can relate to Macdonald’s character it may hit close to home. She brings a tremendous amount of genuine honesty to the role as she is one of those actors who seems to always add a bright spot to any film she is in. There is enough charm to keep you interested in this story and as you follow Puzzle to its inevitable conclusion. Even if all the pieces don’t quite fit, there is enough there to enjoy. A lot of us have gone through this thing called life, where we get into ruts, and even though this film is nothing unique, the characters help it along nicely. When it is all said and done, it’s not how something is put together, but what the finished product ends up being that matters, and to me that is the perfect way to describe this film.